I had the pleasure of interviewing the beautiful Fierce Factor Boss Nicole Roberts Jones. She has worked in the entertainment field in Talent Management. She is a transformational speaker, best-selling author and Coach. She is CEO and founder of Fierce Factor Lab and the creator of the Fierce Formula. “Drawing out what’s best in you… It’s Time To Bankroll Your Brilliance”. CP: What made you decide to become an entrepreneur? NRJ: I never really decided to be an entrepreneur, I really saw a need and started to fill it. And I saw this need at a time in my life when I began to ask myself question like, Why Am I Here? What was I placed on earth to do? Keep in mind this was duringone of the greatest seasons of my life, by everybody else’s definition. And I spent years being OK with everyone else’s definition of who I should be and what I should do. And what I realized in this moment is that I had built an incredible career in the entertainment industry. This was back in the 90’s when I was working for Viacom’s largest cable network, we had an outreach to over 89 million homes on a weekly basis. From there I was elevated into a position working for the #1 TV show on FOX and then from there I worked with an entertainment group where what we produced generated over 12.6 billion dollars annually. I was doing all of that plus I was going to all the HOT Hollywood parties. I was bumping elbows with all the stars, I was living the DREAM! However, it had become my nightmare. Now don’t get me wrong Hollywood was GREAT! But in the dark of the night when I was by myself, I began to realize that I had followed a path that other people had defined for me. I realized, I did not even know my own soul. CP:What are the keys to a successful life and business? NRJ:I am sure you have heard about and probably tried tips and tools to achieve what is called work / life balance. Trust me, I have too and it was frustrating. I consistently felt like I was failing, not meeting my own goals for balance in my life, feeling a little chaotic when life threw a wrench into my perfectly laid out plan that made sure all parts of my life were in perfect balance. Then I read an article by a brilliant business man and master networker, Ivan Misner. I call him one of my silent mentors because reading that article changed everything for me. In this article Ivan wrote about the misconception of having a balanced life and as I read it I thought, “this is exactly what I was thinking can you get out of my head!!! ?” It was like I had an epiphany right there in the middle of reading his article and I started thinking and living differently right from that moment. I tried something out after reading that article that actually made me feel more energized, successful, joyous, and peaceful. This is something I now teach my clients that I call living an equalized life. So, let me first explain why I shifted from focusing on balance to equalizing my life. “Balance” assumes that we spend an equalamount of time in all or most areas of your life. It is like the image of the scales where everything is completely in balance. Well, the problem with that is that almost no one can really achieve perfect balance and there is NO ONE balancing act that is a cookie cutter approach that works for EVERYONE. Shoot most people I know and clients I have worked with over the last 20 + years tend to live such hectic, busy lives that it is incredibly difficult to fit it all in if you do it from a balancing perspective. So, if we can’t have a balanced life, then what can we have? This is when the concept of having an equalized life hit me. So to help you understand this, let me ask you, have you ever jumped in your car or just turned on a radio anywhere and as you turned on the radio you thought to yourself, “boy the sound is off in here “ and so you go to the equalizer on your radio or your sound system to find the perfect blend of what sounds good to you? And what you have to know about that is what is a perfect blend for you may not be a perfect blend for anyone else. It is all about what you enjoy for YOUR listening. Well I believe we can create a life that is equalized that is the perfect blend of what you need to have happen just for YOU. The difference between balance and equalize is that it is a different way to see how you live your life, how you see your life, and how you plan, spend and feel about your time. When you equalize your life, every area is allocating time based on importance and what works in the moment FOR YOU!!! Learning this for myself and seeing how other have implemented this I have seen that somehow, even though things aren’t equal on the whole, life still feels complete. That is because using this concept I feel like I have a blend of all that I need. This has really been the key to growing a successful business, marriage, body etc… everything in my life is equalized and just feels so much better doing what I need, when I need it. CP: How did you come up with the name Fierce Factor Lab? NRJ: FIERCE is a play-off of Beyonce, and her alter ego while she is performing = Sasha FIERCE. When Beyonce is on the stage she is standing in the FULL power of her gift, her calling, what she is meant to do and meant to be and she is unapologetic about her greatness. See in my epiphany moment back in 1993, I felt like I had finally gotten to a place where my soul was alive as I began to live as the highest and best version of me. No more apologizing for being who I am, no more playing small, more trying to fit it. I felt free to be me and that is what I define as FIERCE as I also am to help every woman I blessed to serve to live as the highest and best version of who she was born to be. 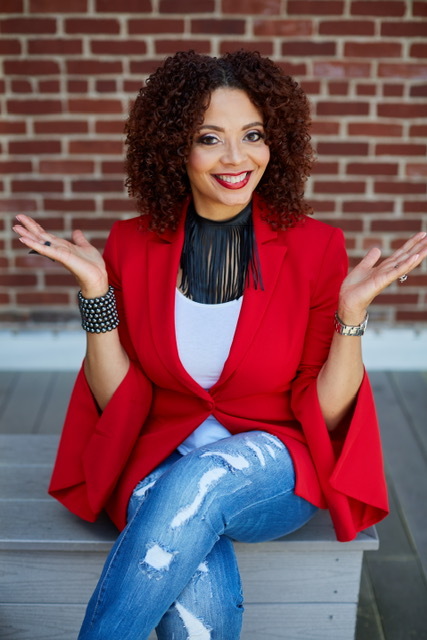 So, with the definition of FIERCE what we are is a one stop shop for women to get every tool, every strategy they need to not just stand in the power of their gift but to create multiple streams of income from it. CP: You have a slogan; It’s Time To Bankroll Your Brilliance. What is it and what does it mean to you? NRJ: First you have to understand that, that gift in you is the answer to someone problem and one you know that and begin to say yes to Be The Answer to the people that need you, our next step is to grow a business using your brilliance or what some would call your intellectual property. Your Intellectual property is the unique factor that sets you apart. It is your expertise, your brilliance where your talents, passions, personality, and experiences collide. It’s that genius that flows from you effortlessly and the thing that everyone seeks you out for. Not only that, sharing this knowledge you’ve acquired is like second nature to you. So, when people ask you if they can pick your brain or tease something out with you, they are tapping into your intellectual property. So instead of giving it away for free, the key is to set up your business around it. What most billions won’t tell you is that they have multiple streams of income. And in business most people focus on a 1 to 1 model vs a 1 to many model. So, if you are going to really grow your business you have to make sure that those multiple streams include both a 1 to many model as well as ways that you make money while you sleep. Meaning packaging ways to serve people DO NOT include you being present. CP: Who is Nicole at her core? NRJ: Who I am at my core is a woman who LOVES God, who wants to live my life pleasing to him and look good while I do it….LOL… In other words. I love Jesus & Fashion!!!! I am a servant leader who always wants to leave people better than before they encountered me. CP: What challenges have you faced? How did you overcome them? NRJ: In order to move forward in my life, I had to release my limiting belief of not feeling good enough. I had to let go of being so focused on what other people thought about me and what other people said about me. What they thought I should do and be and instead, really begin to define me for myself. For years I was so focused on being liked and fitting in that I was playing small. This was first brought to my awareness back in 1993 and it was in that moment that I began to do the work to stand in the full power of me unapologetically. Because this was such a new place for me. I started seeking out anything I could to grow me. I first started with reading books, the first book I read was “Woman Thou Art Loosed” by T.D. Jakes and then there was “Value in the Valley” by Iyanla Vanzant. It was in this season that I realized I love books as I ordered book after book after book to grow me. Next, I started to attend conferences and it was the combination of the two, reading and workshops, that I actually began to identify my passion for helping people recognize and define their power and how to stand in it every day. I loved it so much that I really wanted to do this full time as my career. However, this was 20 years ago, when being a coach was not popular and I had no idea what to call this thing I felt so passionate about doing. Well eventually, all my research of how to grow this gift in me led me back to school and I got a Master Degree in Social Work. My MSW taught me the skills I needed to work one on one as a personal development coach and gave me the tools I needed to work to develop programs and curriculum as a curriculum development coach. Additionally, as I began to grow me, I started attracting people to me that were in the same plight I was in, to find themselves. In this space, I began to grow a powerful network of women that became my accountability circle. With this group, I could brainstorm about ideas and concepts and find the support I needed to sharpen my business and personal skills. CP: You are also an author. How did you get started? What made you decide to become and author? 8. Why do you think it’s a challenge for women to believe in who they are and become Fierce? CP: What is next for Nicole? NRJ: What’s next for me is to serve more and more women. My ultimate goal is to serve a million women to move their purpose into their paycheck. CP: Where do you see yourself in the next 2-3 years? NRJ: I see myself on bigger stages, bugger platforms, I see myself serving MORE and touching MORE. CP: What is the best advice you can give to a entrepreneur who feels like giving up? How does one handle the obstacles that come? Be Confident – Know that you already have everything you need. You were birthed with the purpose, the gift to do or to be something special. All you have to do is…..
Get Clear & Stay Focused– What is your purpose. In what way can you fully exercise your gift? What do you want? You have got to be clear on how you will work to make your dream real in your life. This is why people make vision boards, so that they can get clear & stay focused on what they want and what they are working toward. You can’t hit the target if you can’t see where you are pointing the arrow, so you must be clear, and stay focused on your goal. Make a Plan– From your clarity, the true key to focus is knowing what action you need to take NOW. Look at where you are today and figure out how you get to where you want to go. What do you need to do to get there, how long will it take, how much money will you need, etc…. plan it ALL out. Be Unapologetic About it– Stop looking for everyone to accept your purpose. To validate it and confirm you are on the right path. No one is pregnant with your purpose but YOU, so you MUST know it is up to you birth it, to make it real in your life. So, move forward without regret, knowing that when your purpose is fully birthed for the world to see, everyone will see exactly what has been string up inside of you. Vocational education – training classes or certification programs. Hiring a Coach- someone that can walk through the process with you and help you design and implement what you need to get done. Finding a Mentor – finding someone that has been there and done that. Someone who can share with you and foster your learning. So today I ask you, what ACTION will you take to move you toward your dream? What is it that you WILL do? That thing you are dreaming about, thinking about, talking to everybody about. How will you move that into ACTIVATION? You may already be successful just like I was but let me ask you do you have this rumble in your belly? A secret yearning for something beyond what you already do at work? Beyond your corner office, your expense account or your 6 figure salary. If you said yes then let me tell you that rumble is there because there’s MORE for you to do? CP: How can others connect with you?